While there’s plenty of innovation in Palmer Johnson’s Super Sport 48 metre, the refusal to compromise is at the core of this carbon-fibre motor yacht, currently in build for delivery in the autumn of 2013. ‘The idea was to design a next generation Palmer Johnson superyacht that freed itself from the conventional compromises that yacht design generally seems to accept,’ says Timur Mohamed, owner of the iconic American yacht brand and former first-class cricketer. ‘Usually, efficient means slow; space and comfort mean a floating home with a forgettable design. Further, we decided to aim for exponential transformations in operational performance and the onboard experience, not incremental improvements.’ Finally, Mohamed wanted all this wrapped up in a package that was still recognisable as a muscular, sporty Palmer Johnson. As this attention to weight suggests, the Super Sport is intended to be a fast boat for its size, as well as a comfortable one. An efficient hull with a bulbous bow was vital to both of those characteristics. The most significant nod toward speed is that the Super Sport is to be built entirely from carbon composite. The benefits are obvious – it’s lighter than aluminium and stronger than steel – but with a complex construction method involving moulds, it is a material usually reserved for racing sailing yachts. 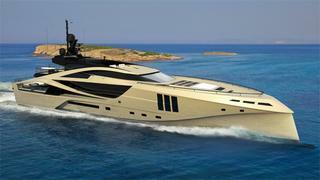 It is an unusual choice for a motor yacht and for Palmer Johnson, which is famous for its aluminium construction. Palmer Johnson is having the moulds, hull and superstructure made at a Norwegian builder that has been working in the material for 15 years. 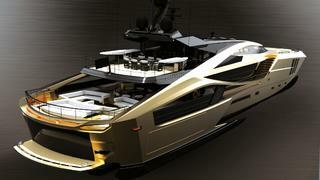 The yacht will then be shipped to the US yard for outfitting and finishing. As well as the owner’s suite forward on the main deck, with full height windows (Mohamed was keen to have as much full height glass as possible, particularly in the main saloon), there are four guest cabins on the lower deck, as well as a tender garage, toy garage and beach club. 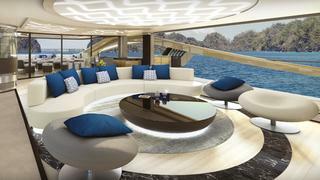 There’s a bridge deck with upper saloon, plus a spa pool and optional helms position up top. 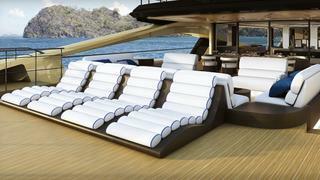 In all the yacht will sleep 12 guests plus eight crew members and a captain. All this had to be contained within a structure that retained the sleek Palmer Johnson look. Featured in the October 2012 issue of Boat International magazine.